At a dining table, runners can be the best decorative item, ensuring you don’t need to think hard about tableware items or decorative accessories. The choice of color decides whether you want the setting to be romantic or pulsating with energy. 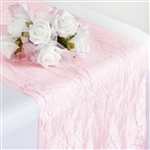 Econoline Crinkle Taffeta Table Runners address all such demands. You can choose taffeta runners for event tables in colors that are coordinated with the wall draping, entranceway floral arrangement, event seating sashes, or even the lighting fixtures. 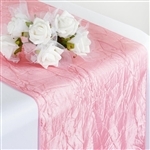 With taffeta, event organizers get the satisfaction of a table fabric that does not need much maintenance. Easy to dry, highly resistant to staining and now, readily available in quick-shipping mode along with the bulk-rate pricing advantage, crinkle taffeta runners for tables are very versatile. Even if you are planning to book a tented event, not trusting nature to hold good for the day, trust these table runners to brighten-up the event tables. Why Econoline Crinkle Taffeta Runners are preferred by event planners? 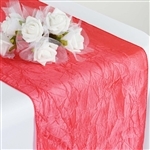 Not averse to being used in wet, hot or humid conditions, Econoline Crinkle Taffeta Table Runners are often chosen in-sync with the centerpieces of the table or color of seat padding or chair cushions. Together, these elements give the décor a unified, color scheme, making it more stylish. Whether it is a vintage-inspired wedding, a club, resort or bistro, taffeta runners make sense for every type of event table. You get the assurance of choosing table runners from the most comprehensive online resource for nearly every type of table linen out there, with runners, covers and throws available for all types of dinner tables, buffet tables, lowboys, food serving zones, commercial kitchen countertops, bars, and restaurant arrangements. These crinkle tablecloths have emerged as the common favorite across the biggest range of themed events, ranging from golf country clubs to spas, casinos, banquets, baby showers, and are commonly ordered by party rental supply companies. Why buy Commercial Grade Table Linens like Table Runners from RazaTrade?